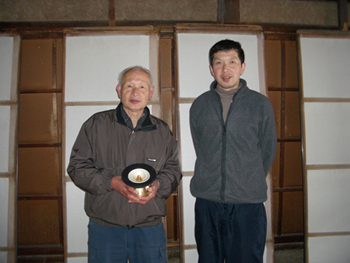 shown: Ichibei and Jun Iwano, 9th and 10th generation papermakers, who created Feastrex's special formulations of washi paper. "Like many hooked audio people, I have been playing with audio equipment for much longer than we care to remember. I started at the age of 11, spending many years following paths that seemed to take me further from my goal. My goal is to try and create a sense of realism with the range of music that I enjoy . . . I am hoping to be pulled into the music to the point that I can forget the interface. My current speakers are D5nf in Teramoto-san's 57-liter enclosure design made from pine boards, with no stuffing at all. Now 51 years old and having given up on this audio illusion many times, I find myself getting nearer to my illusive dream. If I had to compare these speakers to anything that I have owned I would put it with the single pair of Quad ELS57s without the dynamic range limitations inherent in these speakers. The Feastrex D5nf does not compress or breakup even when things get frantic within the music and is able to resolve details I have never heard. "I own both the Feastrex D5nf and the D9e-Type 1. The Feastrex drivers are simply amazing . . . and overall, I have not heard a better high efficiency full-range driver -- and my experience covers various Lowther and Fostex full-ranges as well as coaxial and triaxial drivers from Electrovoice and Altec." "It's all about the tone. I was one of the first people in the US to receive the Feastrex D5nf drivers, and I consider it a privilege. High power amplifiers with low efficiency multi driver speakers from my youth sounded good at the time, but nothing compares to the tonality of a single driver speaker. Tractix horns with bass modules and active crossovers sounded great, but had a very small sweet spot, and way too complex. Not to mention the WAF was a little on the low side. Open baffles four feet high and three feet wide in Lexan dominated the listening room for 3 years with an assortment of drivers in them; PHY-HP, Visiton, and Silver Iris. They all sounded spectacular, but the low score WAF was a problem again. I read about the Feastrex line through Christopher Witmer's posts and the innovations in the product made sense. I inquired about the drivers with Mr. Teramoto, and they were shipped to my door. I have owned drivers from other companies that were very well made, but these are finished like jewelry! Then you hook them up into the system and after a few hundred hours of break in time it's hard to wipe the grin from your face. I tried the open baffles initially, but a small baffle doesn't do the drivers justice, I am sure my Lexan ones would have produced a wider range sound. I have a friend, Ronnie Thackeray of Carolina Audio, who has been involved with transmission line speakers for quite some time. Ronnie did a quick design that really works well with the Feastrex drivers AND has extremely high WAF. It's a single fold transmission line that exits the front and the surface you actually see is only 7 1/2 inches wide and 9 inches tall (they are 18 inches deep, though). They sound as open as an infinite baffle, but extend the low end to a point where bass augmentation is not really necessary. The soundstage is deep, wide and stable. Pianos sound like pianos, oboes like oboes, horns like horns, and guitars and vocals are just what you would expect if the performer was in your room with you. Please note that I have had the same electronics and source for 4 years, and only the drivers and speaker design have changed. No other speakers or drivers have made my strictly battery powered gear sound as good as it does now. Thank you, Mr. Teramoto, for producing the world's finest sound I have experienced in my room! While visiting Japan in 2007, I got in touch with an old college friend of mine. He knew that I was interested in high-end audio, so he asked if I'd be interested in going with him to hear some speakers at a speaker company I had never heard of called "Feastrex." I was initially reluctant because I've heard lots of great high-end speakers over the years, and I very naively thought I'd never hear anything better than what I had heard in the past. (I had heard systems costing up to half a million dollars at various dealers' listening rooms and open houses.) However, I didn't have anything else to do on the day he suggested, so I figured I'd go with him as a diversion. From the very start, I felt that that there was something different about the Feastrex sound, but I couldn't put my finger on it. We listened to a variety of Feastrex speakers, but ended up listening to the D9 Monster Alnico drivers most of the evening we were at the Feastrex factory. All of the speakers we listened to were wonderfully clear and open and natural--that much was obvious. There was also incredible detail; I recall listening to a choral piece with many singers, and it was pure joy to be able to clearly hear the separate voices of the singers instead of having them all mashed together into an indistinguishable "racket" like I've heard on other systems. And when I listened to solo female vocalists (like k.d. lang and Jennifer Warnes) with my eyes closed, they sounded just like they were standing and singing right in front of me, not like recorded music. Now that's something I had never experienced before. But in addition to those qualities, there was also something really "fun" about the speakers that I just couldn't identify. A few months later, I had the opportunity to listen to Feastrex speakers again at the 2007 Rocky Mountain Audio Fest (RMAF) in Denver. (I live in Boulder, Colorado, and I speak Japanese, so my friend in Japan had asked me if I could go to RMAF to interpret for Mr. Teramoto, the man at Feastrex who actually makes the drivers.) After listening to three types of Feastrex speakers at RMAF, I listened to various companies' audio systems in other rooms at the show. I thought that all the systems I listened to sounded truly excellent—until I went back to the Feastrex room. It suddenly hit me that the Feastrex speakers sounded so open and natural and "organic" compared to the other companies' speakers, which now seemed to sound "electronic" and "forced" to me. "Real" and "organic" and "refreshing" versus "electronic" and "forced." I don't know what other words to use to describe the feeling I suddenly had about the difference between Feastrex speakers and other speakers. It's like the singer or trumpet or drum or double bass is right there in the room with you and there is no speaker. Maybe it's because of the special Japanese "washi" paper they use in the drivers, I don't know. Suffice it to say that listening to Feastrex speakers is simply more pure fun than listening to other speakers. I'm now the very happy owner of a pair of Feastrex NF5ex field coil drivers. Listening to music is fun again! speakers. Thereafter I tried various Fostex and Technics single- driver speakers, and these too had the characteristic pluses and minuses associated with single driver speakers. Initially, I was grateful for the pluses and learned to live with the minuses. I never got around to trying Lowther, AER, Goodmans, or any other of the more sought-after European full-range drivers, whether vintage or currently in production. Being in Japan, using these European drivers would have entailed a lot of extra effort and expense on my part, which I was not prepared to make. However, around the year 2000 I encountered the defunct Exact brand and became deeply enamored with these full-range drivers, which, for me at least, definitely took full-range performance to a level I had never imagined possible. The encounter with these 12cm and 16cm speakers was a transformational experience for me; I found myself being irresistably attracted to their sound and determined to own some despite the fact that these fully handmade drivers cost several times more than I had ever paid for any full-range drivers in the past. Eventually on a local Internet auction I found a 16cm pair of entry- level Exact drivers made around 1976 and an appropriate pair of enclosures from around the same period, and putting these together I was in heaven. I knew that there were any number of better Exact drivers available (at that time), but even the cheapest entry-level units from a quarter century earlier were the most musical and satisfying speakers I had owned up to that point. Shortly thereafter I learned that a new company was being started to resurrect full-range driver building in the Exact style, and if possible to carry it forward to a new level appropriate for the 21st century. This new venture was eventually to become the Feastrex brand. I knew that Mr. Teramoto, today the principal builder of Feastrex, was studying the fundamentals of building under Exact's Mr. Sano. Because I was a fan of Exact, initially I was rather skeptical of Feastrex and it came as a surprise when Mr. Teramoto told me, "There's nothing wrong with Exact drivers that can't be fixed by abandoning all of Mr. Sano's innovations." To this day I still have a fond spot in my heart for Exact drivers, but eventually I was won over entirely to Feastrex, because Mr. Teramoto's drivers just kept getting better and soon all thoughts of Exact in my mind were abandoned. Feastrex drivers are also considerably cheaper and easier to use. Now when I look at any Feastrex driver I am struck by how incredibly "overbuilt" they are. Almost any other full-range driver will look wimpy in comparison. From the moment you first lay eyes on Feastrex drivers, you get a sense that they are in a league of their own, and this is borne out by the listening experience, which is best described as INTENSE! There is a lot of passion in these drivers. With the fanatics at Feastrex, every aspect of building is taken almost to excess, because they know that by refusing to compromise on any detail it is possible to end up with better sound. I consider them the Stradivarius of full-range drivers. Right now, I'm 47 years old, but I'm sure the Feastrex drivers will outlive me, even if I live to be very old. Even if I had unlimited space and unlimited money, I would never go back to large multi-way speakers. I think that the best multi-way speakers are wonderful, but ultimately, for me, I don't think they can provide a more musically satisfying listening experience than a Feastrex single driver loudspeaker. If I had a lot more room, I might consider the 9-inch Feastrex drivers. For me, it is a toss-up as to which is better, the 5-inch or the 9-inch Feastrex drivers. If I could, I would of course like to have both sizes. But I could be happy with either. I also think it is hard to say decisively that field coil drivers are better than Alnico. I also hasten to add that now that I have been smitten by Feastrex, I doubt I could be entirely happy with any other brand of loudspeaker. Feastrex has spoiled me for life. I think Feastrex ownership definitely tends to be a one-way street. People come to Feastrex, but they don't leave. At least, that has been my experience and the experience of my friends. To my thinking, Feastrex speakers have all of the best features of full-range drivers in spades, and virtually none of the minuses that people associate with single-driver loudspeakers. So I think the long-term prospects for this brand are very bright. I would like to tell anyone reading this, if you have never heard Feastrex loudspeakers, you are missing a real treat. If you have a chance to hear them, by all means do so! Your music listening may never be the same.